Thank you for visiting the Free-Bullion-Investment-Guide's latest blog post, I hope that you and your family have had a great week. Before we get to this week's post; below are a few of Last Week's Best News Articles that were taken from this guide's homepage. DiMartino Booth - Pension Tension, Part 2: Don’t California My Texas! Econimica - Misconceptions of "Normal"
Honest Value Never Fails - Silver Sale - Now is the time to buy! 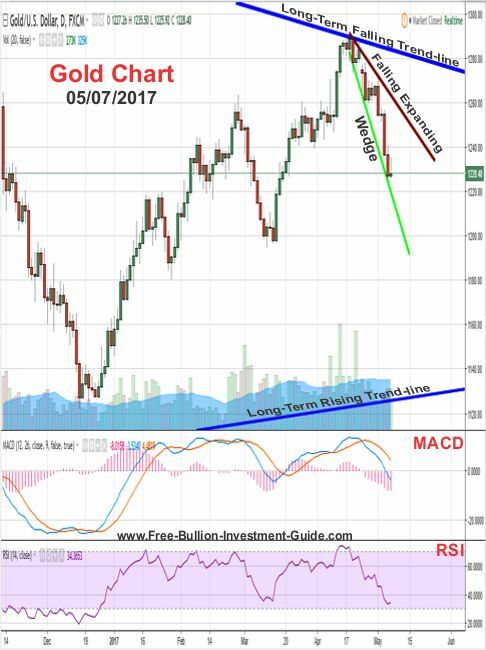 Last week, the silver chart below was posted along with the following analysis. 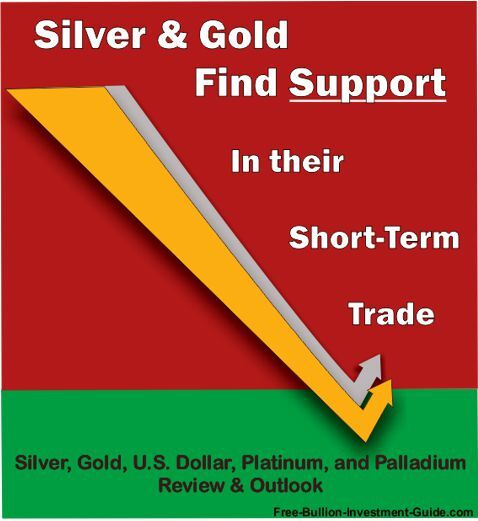 Now that silver has found support at the $16.30 level, silver's price should start to rebound. Its RSI is deep into oversold territory and its MACD is slowly starting to change direction. 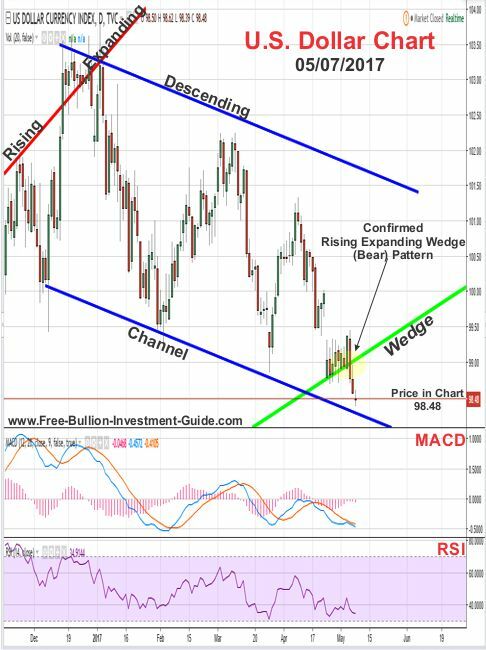 This week, after all the lines from last week's chart were wiped away, a positive pattern has formed on silver's chart; a bullish falling expanding wedge. In the week to come, we should see silver reverse its free fall in price and slowly start to move back up in price. 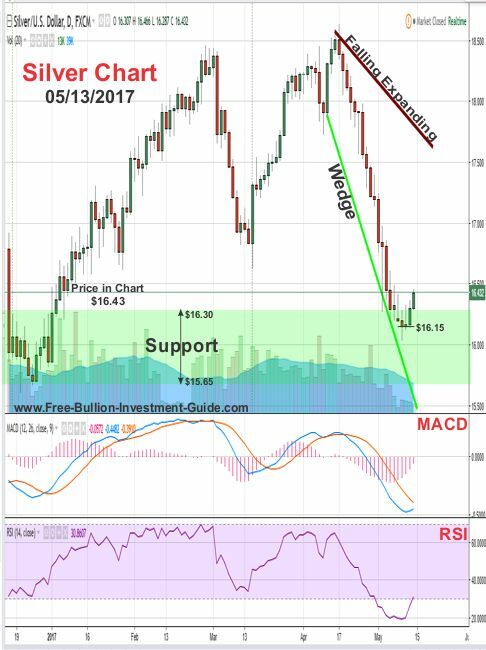 As we can see in the chart below, silver fell a little below the $16.30 and found support at $16.15, then it started to move higher. Silver is still trading inside the falling expanding wedge and it will continue to trade inside it for at least a few more weeks before its price starts to trade near the wedge's upper trend-line. 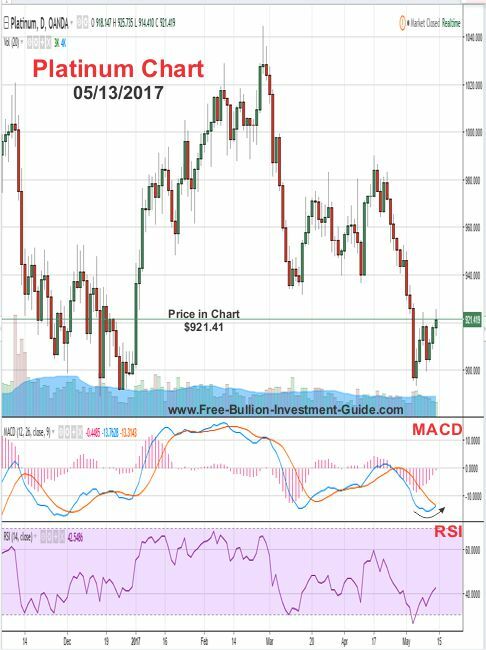 For the week to come, silver is trading deep in oversold territory and it is expected to continue to slowly rise in price, with some profit taking along the way. 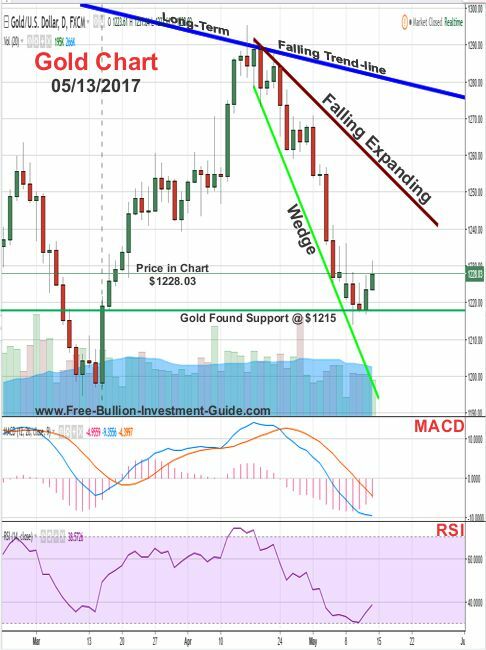 Like silver, gold’s chart this week is showing a bullish falling expanding wedge pattern. Even though gold looks like it may fall a little more in price, we should see gold slowly reverse its pattern, like silver, and move higher this week. Last week gold found support at the $1215 level, then it slowly reversed its price direction and started to move higher. 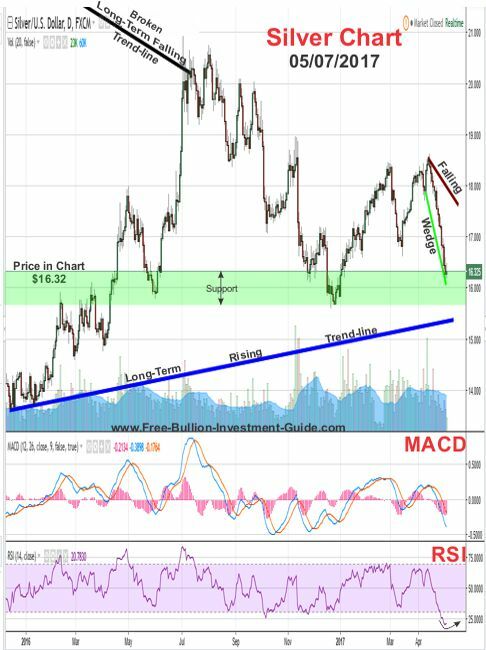 This week, gold’s MACD and RSI (bottom indicators), are showing that gold is trading in oversold territory, so for the week to come gold should continue to slowly creep up in price. 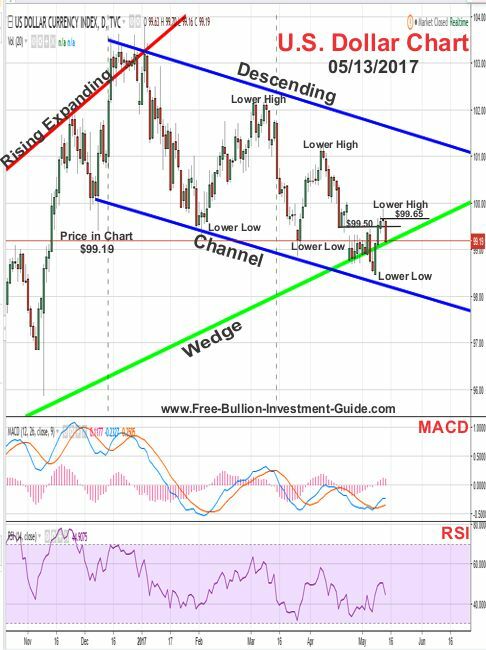 Furthermore, like silver, gold is expected to trade inside its falling expanding wedge for at least another week or two before it starts to come close to testing its upper trend-line. “.… as the dollar broke below the bottom trend-line of the rising expanding wedge, it also fell below the $99.50 support level, turning it into a strong resistance level. As we can see in the chart below, the $99.50 resistance level wasn’t as strong as I thought it was, because the dollar’s price rose up through it and didn’t stop rising in price till it found resistance at the $99.65 level. Furthermore, the dollar broke back above the bottom trend-line of the rising expanding wedge and it ended the week sitting on top of this trend-line. However, the U.S. Dollar continues to make lower highs and lower lows, so it is expected to fall back below the rising expanding wedge sometime in the near future. Last week. I posted the platinum chart below. Although platinum rebounded from last week’s drop in price, its chart still isn't showing any clear technical patterns to mention. However, platinum's MACD (lower indicator) is giving an indication that platinum should continue to rise this week. 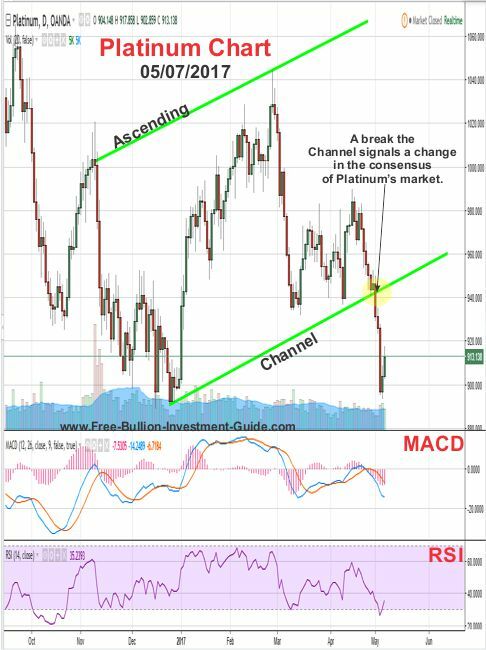 If you’ve been following my analysis for the last few months, you’d know that all the precious metals have been trading inside an Ascending Channel, and all have been broken except for Palladium's Channel. 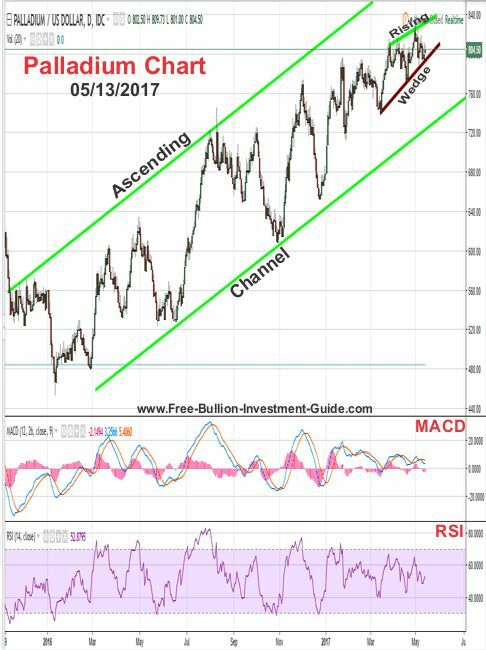 Palladium has been trading inside its ascending channel since Dec. 2015 and so far it doesn’t look like its going to stop anytime soon. However, palladium has found itself trading inside a negative pattern called a rising wedge, so although its long-term trade looks positive, its short-term trade doesn’t.